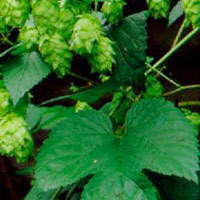 The hops plant, Humulus lupulus, is a climbing plant native to Europe, Asia, and North America. Hops are the cone-like, fruiting bodies (strobiles) of the plant and are typically harvested from cultivated female plants. Hops are most commonly used as a flavoring agent in beer. Hops is one of a group of “nerve tonic” (nervine) herbs used in traditional herbal medicine for people with anxiety, with few reports of toxicity. Hops has a long history of use to soothe the stomach and promote healthy digestion and appetite.